Calamus burkillianus Becc. ex Ridl. This species is accepted, and its native range is E. Peninsula Thailand to Peninsula Malaysia. Clustering moderate sized rattan forming dense thickets. Stems climbing to 20 m, without sheaths 1.5.cm in diameter; with sheaths to 3.5 cm. Internodes to about 20 cm long. Sheaths dull green, armed with scattered triangular spines to 1.2 cm long by 4 mm wide, green tipped black with yellowish bases, the spines sometimes grouped in 2's to 3's into horizontal groups; pale brown indumentum abundant between spines. Knee conspicuous. 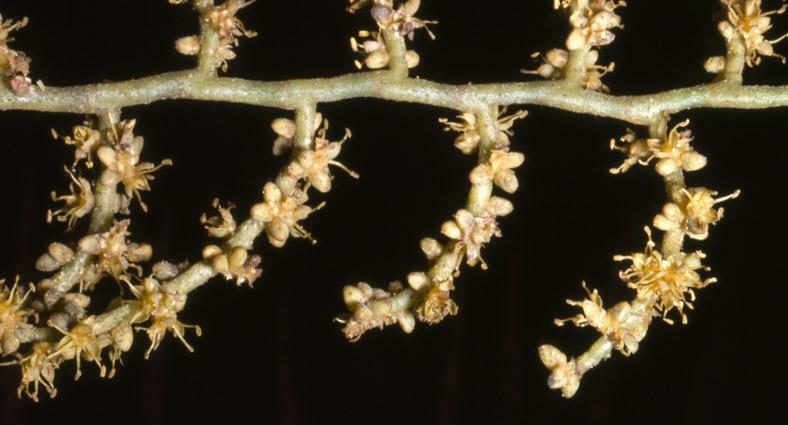 Ocrea moderately conspicuous, to 5 mm high densely hispid. Leaf moderately robust, ecirrate to 1.5 m long with up to 40 leaflets on each side of the rachis. 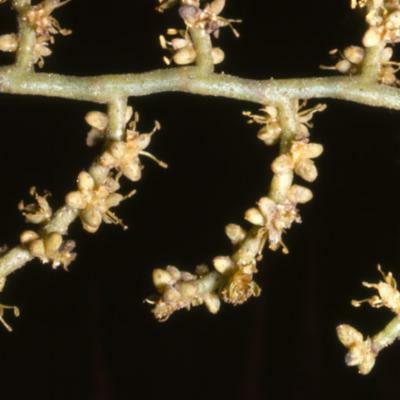 Petiole well-developed, to about 40 cm, armed with scattered short triangular spines. 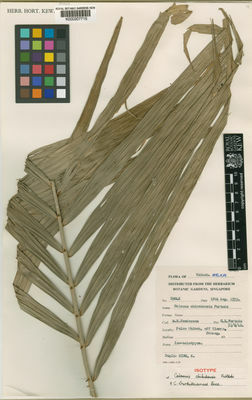 Leaflets regularly arranged decreasing in size towards the tip arcuate as is the rachis the longest about 35 cm long by 2 cm wide rather abruptedfy decreasing to 10 cm by 1.5 cm near the leaf tip drying pale green, armed with brown bristles to 5 mm long on 1.3 main veins above and sometimes on main vein beneath, and on the margins at the leaflet tip; rachis covered with pale brown indumentum when young; apical leaflet pair joined slightly. Flagellum to 4 m long. Inflorescences male and female superficially similar, to about 4 m long bearing 7 or more distant partial inflorescences, each bearing regularly arranged reflexed rachillae in two ranks; male rachillae bearing tight groups of male flowers; inflorescence bracts moderately armed with short yellowish, black tipped reflexed thorns. Mature fruit ellipsoid somewhat pointed at both ends, 10-12 mm long by 5-6 mm in diameter covered in 15-16 vertical rows of pale green or whitish scales with dark margins; sarcostesta green, extremely bitter. Seed oblong to pointed at both ends, very shallowly pitted, endosperm homogeneous. Seedling leaf with 4 very fine small divaricate leaflets. Apparently a good cane but too rare to be significant.